Bush roses have many landscape uses. Use them as hedges, in beds, as boundary plantings, in front of evergreens, with or among other shrubs. A rose bed is even more attractive when it is bordered with low annuals. 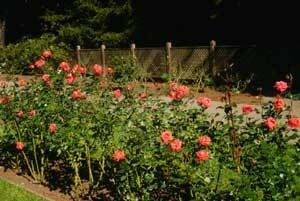 Plant bush roses in groups of three of the same variety to achieve maximum visual impact. Hybrid teas do not fit in comfortably with other types of plants. They are best used as specimen plants, or grown for cutting in a bed of their own. Floribundas, not particularly attractive as specimen plants, are usually grouped on a site. They are ideal for landscaping, particularly where massed color is desired. They are the easiest of the bush roses to care for. Use them as hedges, foundation plantings near walls or fences, as cutting flowers. Grandiflora roses, developed only 30 years ago, are taller than the floribundas with abundant clusters of fairly long stemmed blossoms, and are ideal for a background border. Roses are for cutting! To prolong the life of cut roses indoors, cut blossoms in late afternoon, at dusk or, next-best, in the early morning while the air is still cool. Roses cut during the heat of the day will quickly wilt for lack of moisture. Cut those flowers that are only partially opened. Flowers with few petals open more quickly than those with many petals, so single blooms will last longest if picked when they are barely starting to unfold. Immediately upon cutting the blossom, plunge both foliage and blossoms into a bucket of tepid water carried right into the rose garden. Avoid taking too much foliage from plants under 3 years old. In mature plants leave at least two leaves above the main stem. Make a cut at a 45 degree angle, just above a five-leaflet leaf with sharp pruners. New growth will originate from the base of this leaf, so choose a leaf facing toward the outside of the plant. Place cut flowers in water in a cool place out of drafts until its time to arrange them. Retard the opening of buds further by keeping them in water in the refrigerator. For display choose specimens in various stages of early blooming to give the arrangement a less uniform, and more interesting appearance. Remove thorns and foliage that will be below the surface of the water, but do not scrape the stem with a knife. Make a fresh cut at a sharp angle at least 1/2 inch above the end of each stem to expose as much of the cut surface to water as possible. Then plunge stems deeply into hot water, (about 120°F). Allow the roses to take up water for about 30 minutes, until the water cools, then set them in a cool place. Revive wilted roses with the same procedure. Fill the vase with half fresh water and half 7-Up, Sprite, or a commercial cut flower preservative diluted according to its instructions. Place the flower arrangement away from drafts and direct sunlight, and move it to a cool spot at night. Many gardeners feel it's worth the extra effort to change the water daily and make a new cut in the bottom of the stem every couple of days. 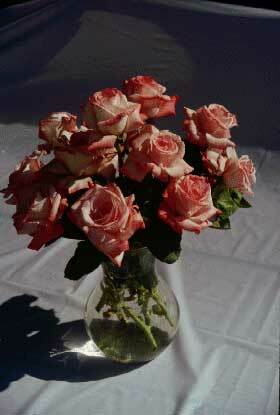 Some rose experts suggest that roses with small, glossy leaves tend to have the longest vase lives. The less leaf surface area (and hence the lower the transpiration rate), the better. Other rose experts say that those with stiff petals are last a long time. Most lavender roses and most yellow roses tend to be short-lived. Some varieties of roses that are long-lasting when cut are: ‘Little Cameo’(peach); ‘Mercedes’ (orange), ‘Marina’ and ‘Gabriella’ (orange red); ‘Cardinal’ (red); ‘Volare’, ‘Samantha’, and ‘Royalty’ (deep red); ‘Garnette’ (red/ pink; ‘Motrea’ (deep pink); ‘Bridal Pink’, ‘Ilseta’ and ‘Lady Diana’ (pink); ‘Pearleta’ (cream); ‘Moonlight’ (off-white); ‘Golden Times’ (yellow). Dried rose petals are a staple of traditional potpourris. Pick fragrant rose blossoms after the morning dew is gone, but early enough so that the essential oils remain. For a moist potpourri, pull the petals from the blooms, spread them on a drying rack away from the light for a few days until they are limp. For a dry potpourri, dry the petals completely, from 4 days to 2 weeks by warming them on a cookie sheet in the oven. Keep the door ajar to allow moisture to escape, and stir the petals for even drying. The petals will lose some color intensity using this technique. Rose petals are edible and the hips, or fruits that remain when the flowers are spent, are very rich in vitamin C. Only fragrant hybrid tea varieties have flavorful petals, and even those vary. It is important to sample petals before using them in a recipe. Always take care to eat only those roses that you are sure have not been sprayed with garden chemicals to prevent diseases and pests.